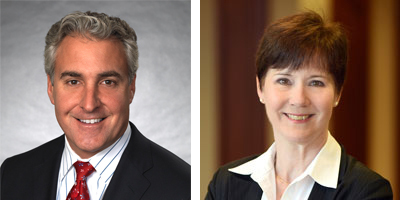 John Petite and Kathy Butler led firm teams that recently scored big wins for two of Greensfelder’s hospital clients, successfully defending separate lawsuits asserted by physicians complaining that they were wronged when the hospitals revoked their clinical privileges and medical staff membership. In the first lawsuit, Antoine Adem, M.D. v. Des Peres Hospital, Inc., Dr. Adem claimed that Des Peres Hospital, a Tenet Healthcare Corporation facility, failed to follow its medical staff bylaws during the process that resulted in the hospital revoking his privileges. Adem sought a preliminary injunction to prohibit the hospital from reporting the revocation to the National Practitioner Data Bank and the Missouri physician licensing board, as required by federal and state law, respectively. Adem also sought a permanent injunction vacating the revocation and compelling the hospital to engage in a new process in compliance with the medical staff bylaws. After a daylong evidentiary hearing on the motion for preliminary injunction, the Circuit Court of St. Louis County, Missouri, granted the hospital’s motion to dismiss and entered judgment in the hospital’s favor on all of Adem’s claims. This effectively rejected the preliminary injunction motion as well. Read the judgment here. In the second lawsuit, Mark Murfin, M.D. v. St. Mary’s Hospital, Centralia, Illinois, Dr. Murfin sought a declaration that the hospital failed to follow its medical staff bylaws and the Illinois Hospital Licensing Act when revoking his privileges. He also sought a permanent injunction prohibiting the hospital from enforcing the revocation decision, as well as millions of dollars in damages for wrongfully revoking his privileges. The trial court entered judgment for the hospital, which is owned and operated by SSM Health, on Murfin’s damages claim, holding that the hospital was immune from damages under the federal Health Care Quality Improvement Act of 1986 (HCQIA) and the Illinois Hospital Licensing Act. The trial court, however, entered judgment in favor of Murfin on his claims for declaratory judgment and injunctive relief. After both sides appealed, the Illinois Court of Appeals for the Fifth District affirmed the judgment in favor of the hospital and reversed the judgment in favor of Murfin, holding that the hospital was not only immune from damages, but also that the process it followed in revoking his privileges complied with the Illinois Hospital Licensing Act and the medical staff bylaws. The appellate opinion can be found here. Sugarbaker v. SSM Health Care, 946 S.W.2d 280 (Mo. Ct. App. 1997). In her health care practice, Butler assists health care providers with the full array of issues they confront in their daily hospital operations. She provides counseling on interpreting and complying with regulations, including federal and state fraud and abuse laws, federal Stark Law and legal requirements for tax-exempt entities. She counsels on compliance plans, internal regulatory reviews and external regulatory investigations and works with institutional and individual clients on physician practice acquisitions and other physician integration strategies. In addition, she provides advice on the development of hospital and hospital-system policies and professional service contracts. She has extensive experience in medical staff credentialing, governance and disciplinary matters, impaired health professional issues, risk management issues, patient rights issues and bio-ethical issues. In that regard, she regularly counsels clients in dealing with physicians adversely affected by medical staff privileging decisions, including best practices for hearings under medical staff bylaws and the reporting to government authorities when a hospital restricts a physician’s privileges. To read a detailed write-up on the decision in the Illinois State Bar Association’s Health Care Lawyer newsletter, click here.